Preparation and serving accessories There are 26 products. Paper cones (250 gr.) for serving bubbles waffle, YooVend logo. Price per set of 50 pcs., no VAT included. Paper cups (150 gr.) for serving bubbles waffle and fries waffle, YooVend logo. Price per set of 50 pcs., no VAT included. The easiest and quickest solution of inducing a thin and even layer of grease on your baking plates. The plant-based spray adds a subtle vanilla falvour to the waffle without being striking. You can also use the Anti-Adherent Spray 100 to grease crêpes plates or other cooking equipment. Price without VAT. 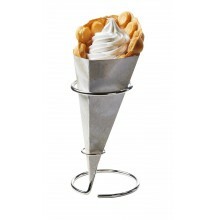 Chromed holder for bubbles waffle. Price per piece, no VAT included. 'Bubble waffle' wall advertising panel with YooVend logo. Price per piece, no VAT included. White T-shirt with YooVend logo. Short sleeve. Available size: S, M, L, XL. Price per piece, no VAT included. Removes incrusted residues effordless • ideal for ovens, baking and grill plates, enamel, ceramics, glass and metal surfaces • new active principle: DECRUST undermines crustifications and dirt and seperates them from the surface, afterwards the detached crustifications can easily be removed • highly concentrated Price without VAT. Black T-shirt with YooVend logo. Short sleeve. Available size: S, M, L, XL. Price per piece, no VAT included. Solid sticks (38 mm thick) made of beech wood for serving Twist Pop waffle. Price per set of 1.000 pcs., no VAT included.